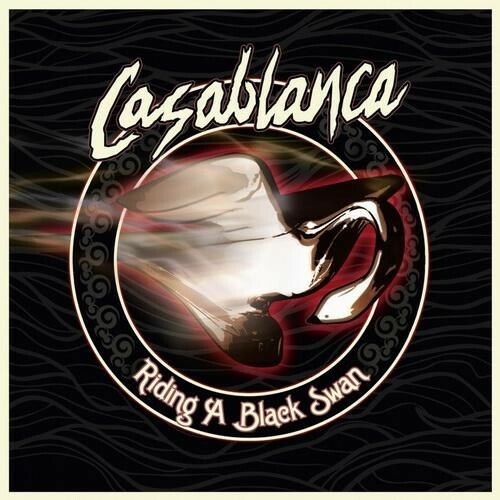 Stockholm based Casablanca debuted in 2012 with 'Apocalyptic Youth', a solid Rock 'n' Roll album that displayed a penchant for infusing the classic seventies sound with a modern twist and incorporating a Sleaze/Glam undercurrent and typical Scandi-type melodies. Demonstrating that much promise has seen them picked up by Sony offshoot Gain, and sophomore effort 'Riding A Black Swan' picks up directly where the debut left off, taking a more mature step in a slightly harder and darker direction but not at the expense of the melodies, though this time around they are not quite as immediate but ultimately become highly memorable. 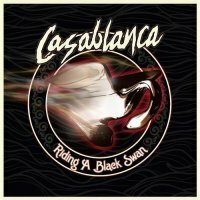 Most notable for featuring Alice Cooper's guitarist Ryan Roxie within their ranks, it's undeniably that the rasping vocals of front-man Anders Ljung are the true key to Casablanca's identity. Having a popular Swedish ex-footballer in Mats Rubarth within your ranks as bassist and Sahara Hotnights drummer (and Swedish TV presenter) Josephine Forsman will also attract some attention. The staccato rhythm and riffing of 'The Giant Dreamless Sleep' is certainly one of the less instant numbers, a dark and challenging way to open the album and requiring several spins before fully revealing its charms. But as soon as first single 'Hail The Liberation' cuts in the melodies promptly hit you from all sides, be it from the soaring chorus or catchy guitar refrains. 'Dead End Street Revisited' continues in the same vein but with an almost Gothic-like undercurrent, while the title track revolves around a fiery riff. The Glam/Sleaze influence rears its head on the short but sweet and distinctly Hanoi Rocks sounding 'Heartbreak City', 'No Devil In Me' is hard-rocking but retains a very melodic chorus and the closing 'Just For The Nite' flits between dark melodrama and all out Rock 'n' Roll. Revealing a strong Thin Lizzy influence is the awesome 'It's Alright' with its dual guitar work from Roxie and Erik Stenemo, while the up-tempo 'Barriers' and Celtic-edged 'Some Misty Morning' could also have come from Lynott and Co. – '...Liberation' even paraphrases 'Johnny The Fox and Jimmy The Weed'. Though they wear many influences proudly on their sleeves, Casablanca have their own special thing going on. Sony should invest some serious cash in these guys as they have the potential to be huge.